Fully shrouded terminals, Contact position indication on the dolly handle. 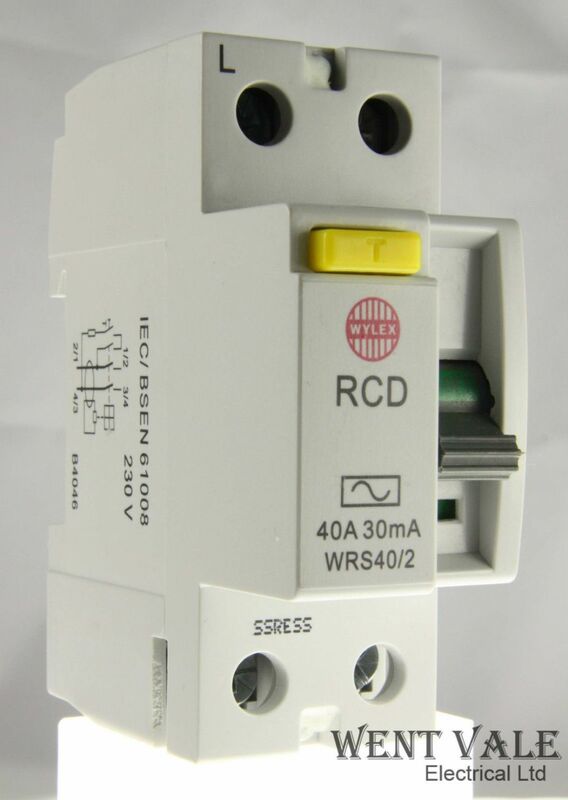 All Wylex RCD's incorporate a filtering device to provide protection against transient surges in the supply to the unit, thus reducing the occurrence of unwanted tripping. You can pay by the followingmethods: PayPal, Direct Bank Transfer (BACS) (pleaseask for our account details) or we take credit or debit cards payments over the phone. For deliveries outsidethe UK . Please Note: Thepostage quoted is for inland United Kingdom postage only .Please ask for a postage quotation before you buy. Internationalpostage will be shipped via a Royal Mail tracked shipping method dependent onthe destination country. Heavy,valuable or large parcels will be shipped with the larger courier services butthese tend to be costly, so you must ask for a quotation before purchase, andlet us know how quickly you need the goods as this greatly affects the price. Please Note: The postagequoted is for both the cost of the postal service used and the costof packing materials used , please take this into consideration when leaving DSRratings. We reservethe right to upgrade the postal service should the need arise, our postagecharges are based on the following bands. Inclusive postage is offered onthis listing by combining the item price and the postage & packing costs. Ifyou require Royal Mail’s “Special Delivery” guaranteed next day delivery thenplease choose that option. I use mainly my own stockphotos so the picture on the listing may differ to the actual listed item, butwill be a match. On rareoccasions we may, during cleaning and final inspection that an item is founddamaged after the sale is made. If this was the last in stock and we have analternative item we will inform the buyer and send the alternative one out. Please E-mail me via the eBaymessaging service as I can't pick up E-mails sent to my E-mail address when I'mout of the office. Thank you for viewing thislisting. Please take a moment to reviewmy other items. Add me to your favourite sellers list andsubscribe to my email product updates. Take advantage of our combinedpostage offer. Please note Went Vale is not registered for VAT, so we are unable to provide VAT invoices.You may obtain all the necessary paperwork from your ‘My eBay’ purchase historysection ‘View order details’. Itis recommended that this item and all my other electrical items are installedby a qualified electrician. The seller takes no responsibility forinjury/damage to persons or property due to incorrect selection or installationof equipment.